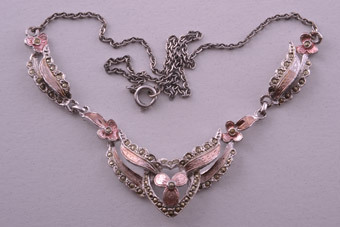 Collar: The collar necklace lies snugly around the middle of the neck. It is generally 30 centimetres (12 inches) to 33 centimetres (13 inches) long. Choker: A choker necklace is defined as 35 centimetres (14 inches) to 41 centimetres (16 inches) in length, and sits tightly around the base of the neck. Princess: A princess necklace is 45 centimetres (18 inches) to 50 centimetres (20 inches) long. This is the classic length for a necklace, and it should sit on the collarbone. Matinee: The matinee necklace length is 56 centimetres (22 inches) to 58 centimetres (23 inches). It is typically a single strand that rests at the top of the bust. Opera: An opera necklace is 75 centimetres (30 inches) to 90 centimetres (35 inches) long and sits at the breastbone – an inch or two below the bust. Rope: A rope necklace is generally 91 centimetres (36 inches) in length, or longer. 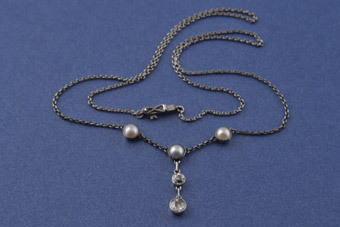 Lariat: A lariat is a very very long necklace, without a clasp, that is often draped around the neck multiple times. In general, when buying a necklace, one should consider face shape, neck size (height and width), body type and clothing preferences, but most importantly, one should love the piece and wear it with confidence and style.